Our new E236N Tool Presetting machine has been developed as the entry level option for our new generation of advanced tool presetting machines. Designed to be bench mounted the E236N features a ground granite base and column, stainless steel construction and ergonomic design combined with a 5.7" TFT LCD Touch Screen. This system provides full operator control and selection of options and functions via an intuitive icon system allowing operational and functional simplicity that is second to none. Also included with our E236N model is our DPP software package. Working via your DNC system DPP converts measured tool data into CNC code for direct loading into the machine controller and associated tool offset pages (First twenty uses free - Dongle option). Machine structure in steel offering high mechanical resistance and long life.. 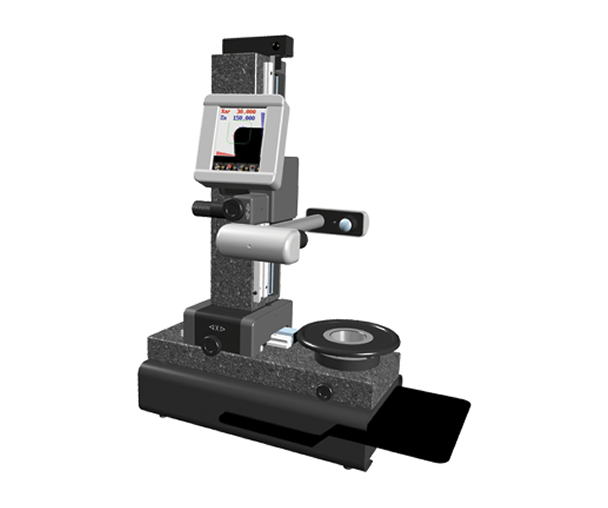 Supplied with ISO / BT Interchangeable rotating spindle-holder (HSK/CAPTO/VDI available as options). Double vault arc prismatic slideways. Double re-circulating ball bearing slides lubricated for life. Manual mechanical braking of the interchangeable spindle-holder rotation. Constant load Archimedean spiral spring (as opposed a mass counter-balance system). Full Colour TFT LCD Touch screen – 90mm x 120mm, magnifications about 20X. C-MOS sensor 0.001 resolution – Framed image area 5mm x 5mm VGA System. TFT 5,7” colour Touch Screen. 9 CNC machine origin management and adapters. 9 Tool lists (99 tools per list). DPP Post Processor universal generator. Axes resolution: X= 1 µm, Z= 1 µm.